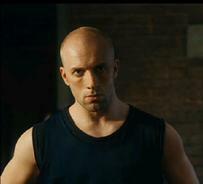 Cyril Raffaelli is now 33 and is a professional traceur, martial artist and stuntman. He lives in France where he trains. Cyril has also been highly credited for his skills in karate and wushu. All of which are useful in being a pioneering Freerunner. He is well known for his part in the Freerunning movie District B-13. In this movie he played a tough undercover police officer who believes in law and government called Damien. Along side with David Belle who played Leïto, an acrobatic ghetto-dweller who fights the gangs and feels cheated by the system. He started his martial arts training at the age of 6. Then at the age of 11 he went on to a more advanced martial art. He also trained in Tae Kwon Do throughout. When he had finished, he realised that he was a great martial artist and acrobat. He then grew up to become a stuntman in many movies. One famous example was Van Damme' stunt double in Double Team. Also he did stunts in Kiss of the Dragon. Here it was obvious that he was a extremely talented fighter and worked with Jet li and Corey Yuen. Now a days he is looked up to as a role model to many amateur traceurs and also some of the professional ones. He is extremely practised in flips and kicks I suppose thanks to his wushu training. More about Cyril Raffaelli's freinds here.